WASHINGTON — The European Commission gave a positive assessment of its Copernicus Earth-observation program, now in its third year, defending the free provision of data and emphasizing a need to make that data more applicable to non-space users. Copernicus currently consists of six dedicated satellites and more than 30 partner spacecraft, each equipped with various cameras and sensors for monitoring everything from atmospheric and marine pollutants to deforestation, climate change and even border patrol. The latest satellite, the Sentinel 5 Precursor that launched Oct. 13 on a Russian Rockot, sent its first pictures today, showing detections of the pollutant nitrogen dioxide over Europe, as well as ash and smoke from the recent Mount Agung volcanic eruption in Bali, Indonesia. “Ministers today backed the Commission’s positive assessment of the Copernicus program,” Carlos Moedas, European Commissioner of research, science and innovation, said in a Dec. 1 press conference in Brussels following an EC Competitiveness Council meeting on research and space. He added that a similar conclusion is expected for an assessment of Europe’s Galileo navigation system. The EC’s insistence on providing Copernicus data for free — not unlike NASA’s Landsat program — stirred fears within industry that commercial Earth-observation satellite operators would be put at a competitive disadvantage. At least two of those operators concerned about losing business to Copernicus have since been bought by foreign players — Deimos Imaging of Spain by Canada’s UrtheCast, and Berlin-based RapidEye by Planet in California. Airbus, undeterred by Copernicus, is building four commercial Earth-observation satellites with sub-meter resolution, set to launch two at a time on the future Vega C launcher in 2020. The report did say that it wants Copernicus data to be easier to use, especially for those coming from outside of the space sector. “The mere availability of data is not enough to maximise its envisaged socio-economic impact,” the report said. That framework determines European Union budget allotments for various programs. The current framework reaches to 2020. The report also said the EC and the European Space Agency (ESA) should be “relying on European launchers as a priority” in orbiting the remaining Sentinel satellites. U.S. launch provider SpaceX is scheduled to launch Sentinel-6A on a Falcon 9 rocket in 2020, having received a $97 million launch contract from NASA last month. NASA, ESA, the National Oceanic and Atmospheric Administration, and the European Organisation for the Exploitation of Meteorological Satellites are all partners on the Sentinel 6A mission. Nonetheless, Europe’s launch industry is seeking a broad commitment from European governments to make regular use of the next-generation Ariane 6 and Vega C rockets. The industry wants annual minimums of five Ariane 6 and two Vega C launches per year from government, or “institutional” customers, arguing that the government market is much smaller in Europe than in the United States, and as a result, such assurances are necessary. The first images from a satellite built in Stevenage that can map air quality across the globe have been released today. Launched into orbit on 13 October, the Sentinel-5 Precursor monitors the atmosphere to help us understand the spread of key pollutants and their impact on our changing planet. The prime contractor for the development and manufacture of the satellite, which is part of Europe’s world-leading environmental monitoring programme – Copernicus, was Airbus Defence and Space, based in Stevenage, Hertfordshire. 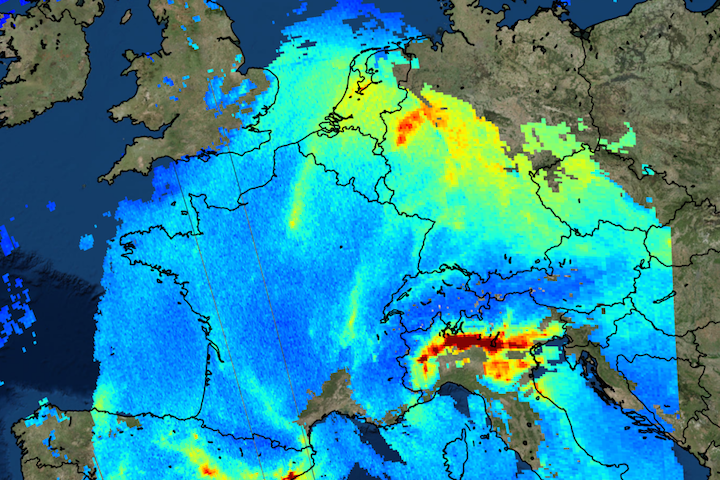 One of the first images shows nitrogen dioxide over Europe. Caused largely by traffic and the combustion of fossil fuel in industrial processes, the high concentrations of this air pollutant can be seen over parts of the Netherlands, the Ruhr area in western Germany, the Po Valley in Italy and parts of Spain. “After only a few weeks in orbit, this UK-built satellite is delivering real results, shining a light on air quality and demonstrating the important role of the UK’s space sector in tackling global challenges. One of the first images from the Copernicus Sentinel-5P mission shows nitrogen dioxide over Europe on 22 November 2017. Another of the first images from Sentinel-5 Precurosor shows ash and smoke from the Mount Agung volcanic eruption on Bali, Indonesia, on 27 November 2017. As well as detecting different air pollutants, the mission also measures aerosols. Data from the Sentinel satellites benefits the UK in areas such as emergency response and flooding, farming and environmental management, air quality, marine planning and fisheries. The Department for Environment Food and Rural Affairs and the UK Space Agency are championing the use of the satellite data for government policy making, scientific research and commercial services, as the data is also available to companies to create applications that help the wider economy. The UK provides investment into the Copernicus programme through the European Union as well as additional UK Space Agency investment through the European Space Agency for the development of the Sentinel satellite technology and instruments. Sentinel-5 Precursor is the sixth Copernicus Sentinel satellite. 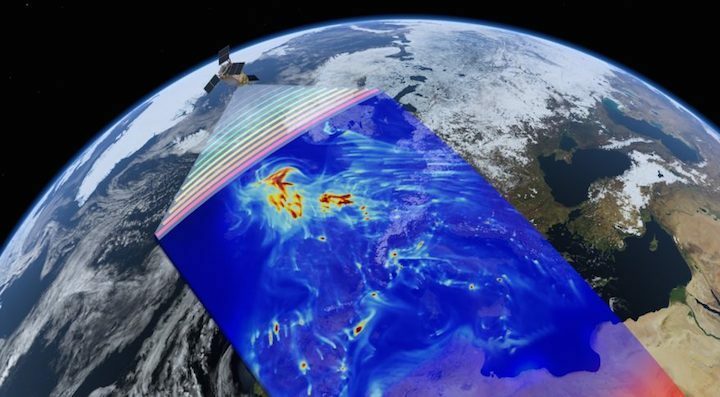 It carries the most advanced multispectral imaging spectrometer to date: Tropomi, developed by Airbus DS Netherlands for the European Space Agency (ESA) and the Netherlands Space Office. This state-of-the-art instrument will map pollutants such as nitrogen dioxide, methane, carbon monoxide and aerosols, all of which affect the air we breathe and our climate. Since the satellite was launched, the instrument has been going through a planned decontamination process. Now, however, the door that kept Tropomi sealed for this purpose has been opened, allowing light to enter and the first images to be taken. Even at this early stage in the mission’s life, these first results exceed expectations. These new images offer a taster of what’s in store once it has been fully commissioned for the task of mapping the entire planet every day with unprecedented accuracy, to take air-quality forecasting to a new level.